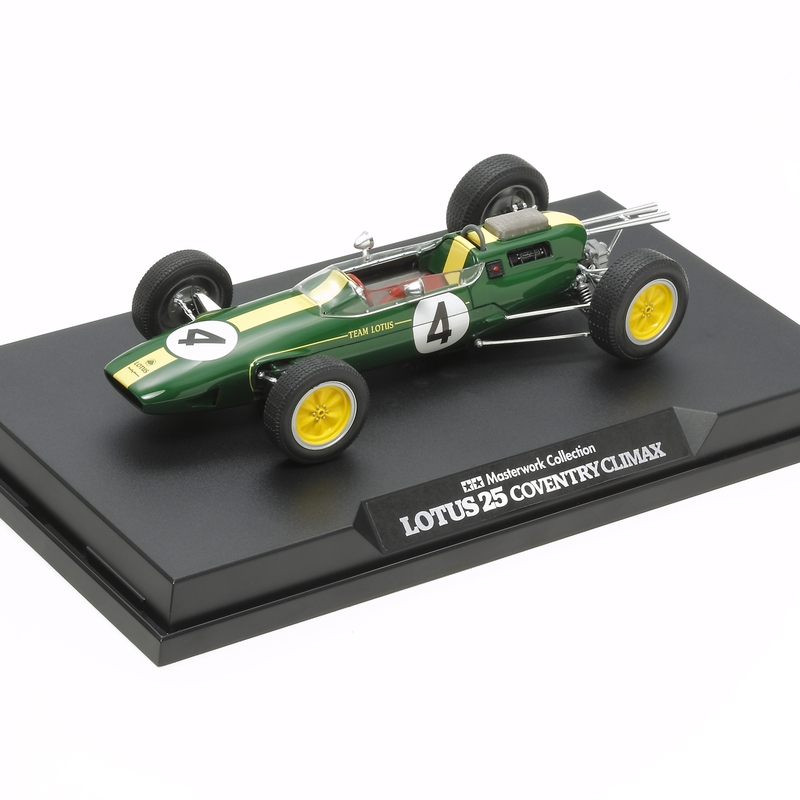 This replica quality finished and assembled model that accurately recreates the form of the Lotus 25 Coventry Climax. It comes pre-painted and ready to display. The car itself is something of a legend in racing history, being the first Formula 1-entry car to employ a monocoque chassis. Its 1.5-liter C8 Coventry Climax engine proved a great partner, powering the car to 7 victories from 10 starts in a successful sophomore 1963 season. Special Feature 1 Coventry Climax V8 engine, front radiator and cockpit are depicted in great detail. Special Feature 2 Features metal-plated suspension arm, engine air funnel and exhaust parts for greater realism. Special Feature 3 Air funnel covers are replicated authentically with stainless steel mesh. Special Feature 4 Brake oil and spark plug cords are faithfully depicted using vinyl tubing. Special Feature 5 Metal transfers are included to recreate screws on the windshield frame. Special Feature 6 Side mirror surfaces are recreated using mirrored stickers. Special Feature 7 The model comes fixed to a display base fitted with nameplate, plus a clear case to exhibit the model.